Finely mince garlic. Trim ends of snow peas and green beans. Trim ends of bell pepper and remove seeds. Peel carrots. Slice snow peas, green beans, bell pepper, carrots, and scallions into thin matchsticks. Bruise lemongrass with the back of the knife to help release flavor. Slice chicken into strips. Heat half of the sesame oil in a wok set over medium-high heat and briefly sear chicken, approx. 3 min. Remove and set aside. Add remaining sesame oil to the wok, then add the curry paste, whole lemongrass stalk, and garlic and fry for approx. 3 min until fragrant. Add coconut milk and chicken stock, followed by the vegetables. Bring to a boil, add soy sauce and fish sauce, reduce heat to low, and let simmer for 5 min. Add chicken and let cook for another 5 min. 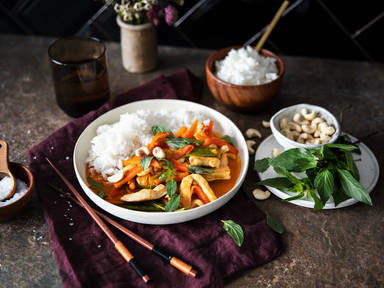 Serve with rice and garnish with cashew nuts and Thai basil. Enjoy!